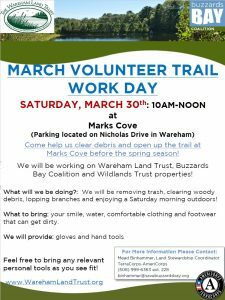 Join us on March 30th from 10am-noon at Marks Cove for a volunteer work day. We will be working to clear debris on the trail systems that cover the patchwork of properties there protected by the Wareham Land Trust, Buzzards Bay Coalition, and Wildlands Trust to get ready for the Spring season! We will be removing trash, clearing woody debris, and lopping branches so please wear comfortable clothing and shoes that you don’t mind getting dirty. Parking is along Nicholas Drive in Wareham. Gloves and hand tools will be provided, but feel free to relevant personal tools as you see fit. 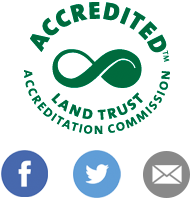 For more information or any questions please contact Mead Binhammer, Land Stewardship Coordinator for the WLT & BBC through TerraCorps-AmeriCorps, by phone at (508)999-6363 x228 or email binhammer@savebuzzardsbay.org.